The last will and testament of Isaac Rich. In the Name of God, Amen. I, Isaac Rich, of Lucama, Wilson County, State of North Carolina, being of sound mind and memory do this 22nd day of March, A.D. 1911, make and publish my last and testament in manner following, that is to say: At my death I wish to be decently buried and according to the wishes of my friends. ITEM. I give my daughter, Martha Ann, wife of James Pearce, one tract of land separated from the home place by a line from the railroad bridge above mentioned, to the old line including the church lot adjoining Mr. Jesse Lucas line and also three and one fourth acres across the railroad, all together containing thirty (30) acres, more or less, to her and her heirs forever. ITEM. I give and bequeath to my beloved daughter, Marilda Forsythe, one tract of land called the grave yard tract, adjoining Jesse Lucas’s line at spring branch, a corner, thence to the railroad corner above, to include two acres across the rail road, the whole together containing twenty one (21) acres, more or less, to have and to hold to her the said Marilda Forsythe, during her life and after her death I bequeath the aforesaid land to Martha Ann Pearce, her heirs and assigns. ITEM. I give and bequeath to my grand daughter, Viola Dawson, after the death of my wife, the home place mentioned in my will, to her and her heirs. ITEM. I give and bequeath unto my beloved wife one horse and buggy her choice at my death. Also her share according to law of the cattle and other stock, and also her share of all other perishable property at my death and the sale of my property. On 30 April 1872, Isaac Rich, son of Branch O’Neal and Rachel Peacock, married Elizar Darden, daughter of Lizzie Darden, at George Thompson’s in Wilson County. In the 1880 census of Cross Roads township, Wilson County: farmer Isaac Rich, 30; wife Eliza, 30; children Martha Ann, 9, Marilda, 7, Zachariah, 5, and Elafare, 2; mother Mary Howell, 65; and George Washington Bass, 15, farm worker. On 13 September 1899, Marilda Rich, 23, daughter of Isaac and Eliza Rich, married Mack Forsythe, 28, son of Alex and Nancy Forsythe, in Cross Roads township. William Forsythe applied for the license. In the 1900 census of Cross Roads township, Wilson County: widower Isaac Rich, 50, farmer; daughters Martha A., 28, and Wibby, 16; niece Lettie Langston, 8, and nephew Rommie Oneil, 8. On 12 December 1900, Isaac Rich, 50, of Wilson County, married Jack Ann Ricks, 35, of Wilson County. Methodist minister G.A. Wood performed the ceremony at the bride’s residence in Wilson in the presence of Moses Depree and Mingo Hines. 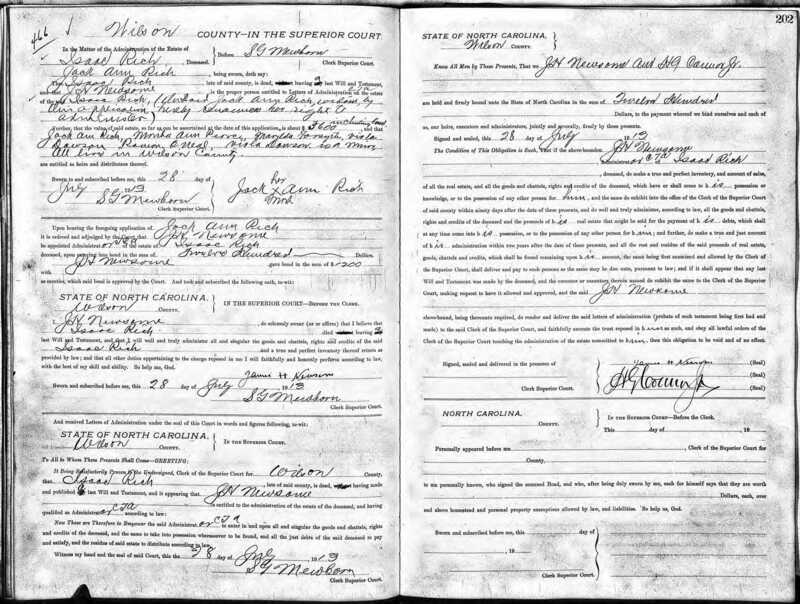 Willie Dawson, 23, of Black Creek township, son of Benjamin and Caroline Dawson, married Susie Ann Richs, 22, of Cross Roads, daughter of Isaac and Eliza Richs, on 12 January 1905. Free Will Baptist minister W.H. Frost performed the ceremony at W.M. Forsythe’s in the presence of Forsythe, William Daniels and Aaron Barnes, all of Lucama. James Pierce, 28, of Cross Roads, married Martha Rich, 24, of Cross Roads, daughter of Isaac and Eliza Rich, on 18 January 1906 at Martha’s residence. Free Will Baptist minister J.M. Richardson performed the ceremony in the presence of Thomas Ayers, William Forsythe and J.T. Horton, all of Lucama. In the 1910 census of Cross Roads township, Wilson County: farmer Isaac Rich, 60, farmer; wife Jacan, 45; nephews Roman Oneil, 18, and Robert Creech, 18; and laborer Bruce Depree, 18. Isaac Rich died in the summer of 1913. James H. Newsome applied for letters of administration for his estate, naming widow Jack Ann Rich and Martha Ann Pearce, Marilda Forsyth, Viola Dawson (minor) and Roman O’Neal as heirs. Rich’s estate was estimated at $5600, including land. Martha A. Pierce died 23 February 1918 in Cross Roads township. Per her death certificate, she was 42 years old; the daughter of Isaac Rich and Eliza Hayes; was married; and was buried in the Ricks graveyard. William Forsythe was informant, and Mack Forsythe, the undertaker. Image of original will and administration letters available at North Carolina Wills and Estates, 1665-1998 [database on-line], http://www.ancestry.com. ← The dangerous lives of delivery boys.